I recently purchased yet another target air pistol so one of the collection has to go, and I’ve decided it’s the Izzy. Excellent condition, not a lot of use. The grips have been slightly sculpted to my XL hands, so there’s plenty of wood left there. One of the e-clips fell off and I temporarilyreplaced it with a neoprene washer that actually seems to hold better. 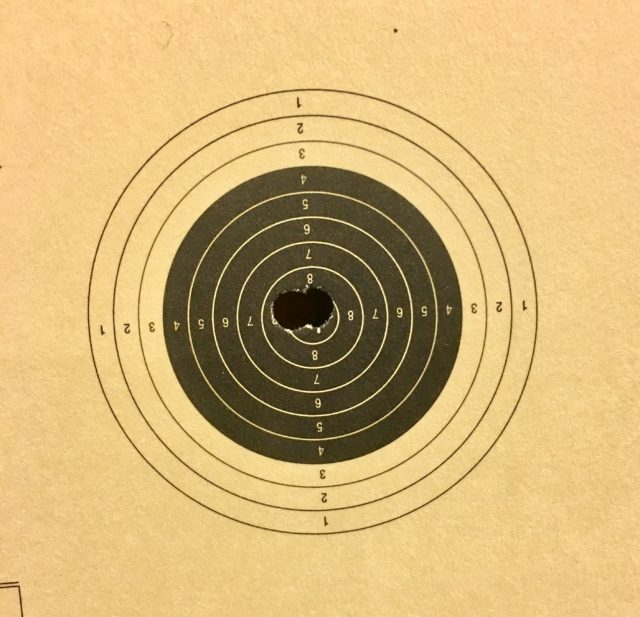 A friend of mine who shoots PPC bought an FAS 6004 last year, thinking it would be good for home practice. A few months later he must have decided otherwise as he offered it to me at an attractive price. I’d been interested in the pistol since first reading about it, and so after an hour of testing it in my basement range I decided I had to buy it. The gun is based on the earlier FAS 604, which was originally made by Domino in (I believe) the 1980s. 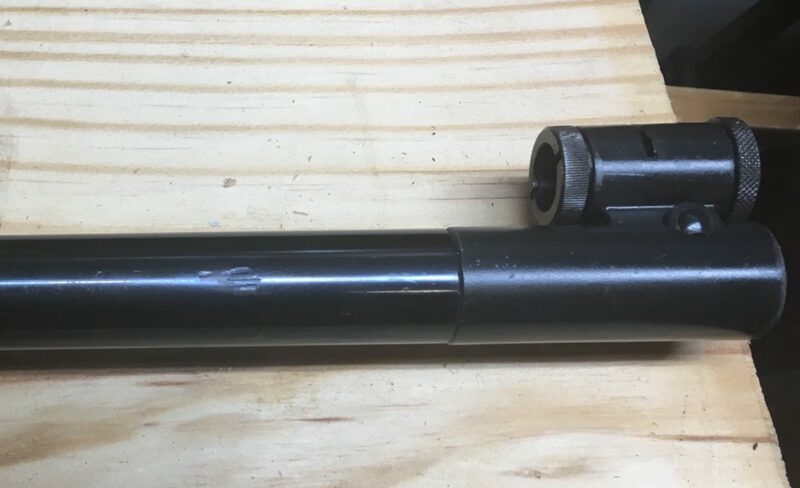 The 604 was a serious competitor in the world of ISSF competition back then, when single-stroke pneumatics like the FWB 100 and the IZH 46 were starting to displace spring guns like the FWB 65/80/90 and the Diana Model 6 from the firing line. It was not a cheap gun, being made of precision made parts, and costing close to $1,000. 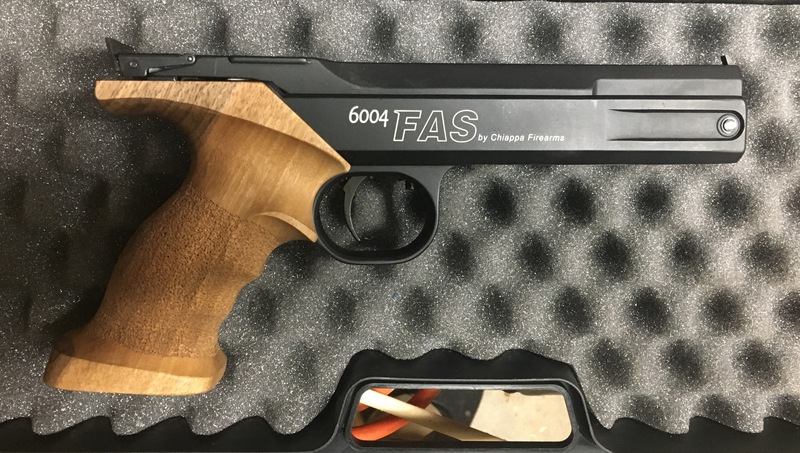 Today’s FAS 6004 is a less expensive clone of the 604 made by Chiappa of Italy that uses more cast parts to reduce the cost of manufacture. Externally, it’s almost identical. From a dozen feet away it’s impossible to tell the difference. The FAS 6004 is available in two models, differing only in the style of grip. Mine is the less expensive ($420 retail) model that uses an ambidextrous wood grip. 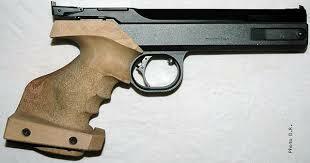 For $550 you can get the pistol with an adjustable wood grip in two sizes and in left or right handed versions. Everything I’d read about the ambidextrous grip said that it’s the best ambidextrous grip ever put on an air pistol and I’d have to agree. 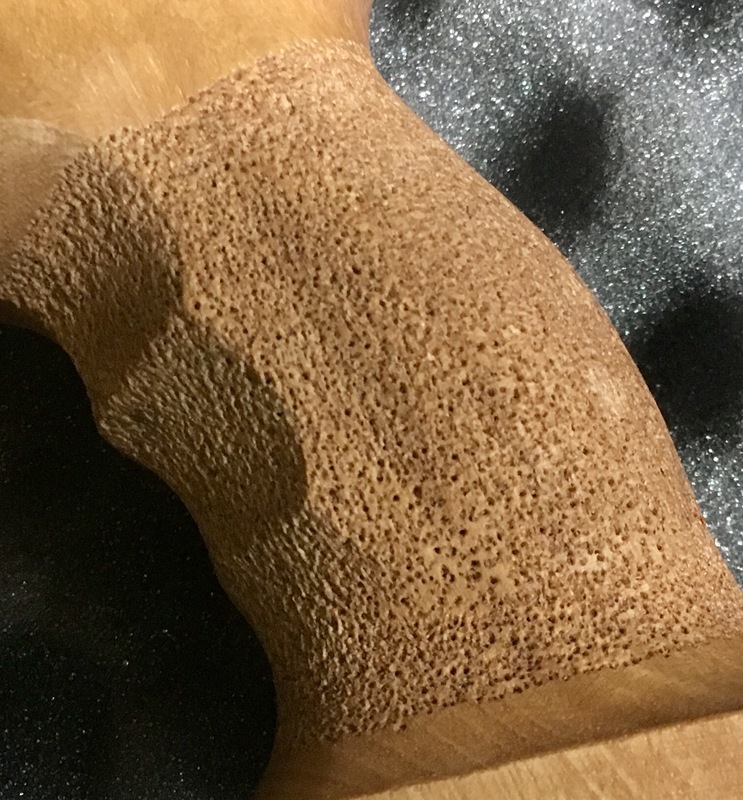 It’s made of solid wood, with a very fine stippling pattern that provides a superb grip. It fits my XL sized hand as well as smaller hands. 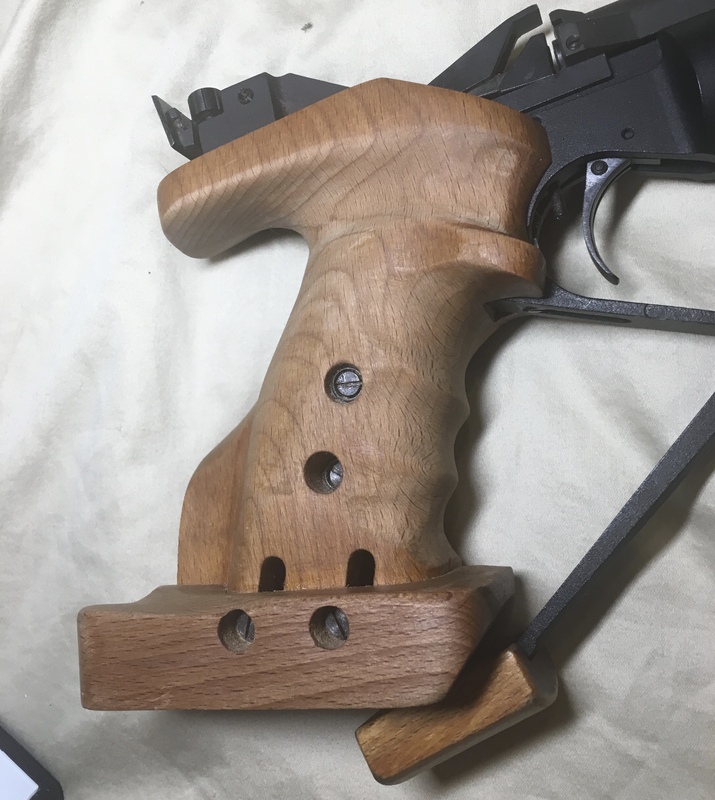 Before I bought it I thought I might upgrade to the adjustable grip, but now I think I’ll stick with it. I really like the feel and the balance of this pistol. It has a solid feel and is just muzzle heavy enough to stabilize it. The sights are easily adjustable, thanks to the large coin-slotted knobs. 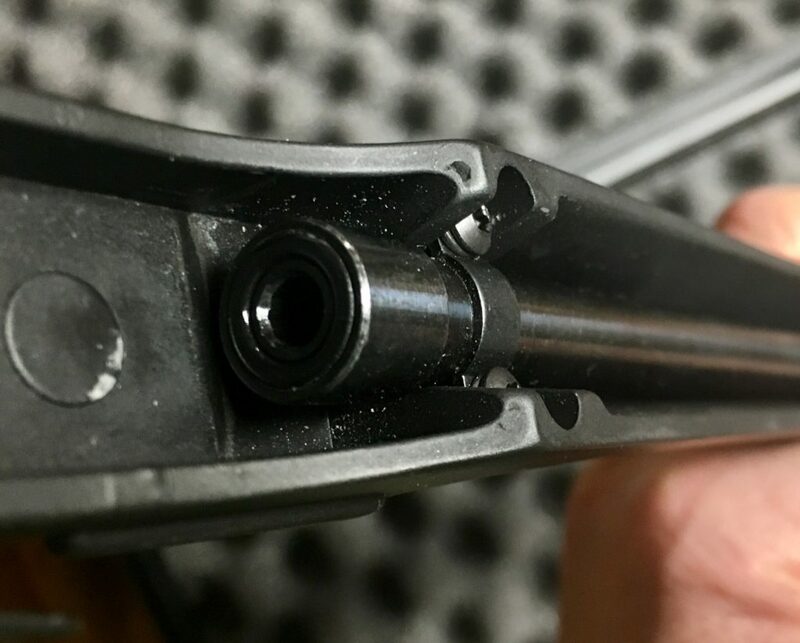 I’d prefer an adjustable width front of rear sight, as I like to see more space either side of the front sight, but shooters with better vision or shorter arms may not see this as an issue. …and the cocking lever/barrel is swung back into place, compressing a charge of air. This takes a fair amount of force (more than is required for cocking an IZH-46m) , and while it’s certainly not difficult for an adult male (or a fit adult female) it’s probably too much for a junior shooter. Shooting behavior is very predictable. The trigger is adjustable for weight, length of first stage, and trigger position. It’s not as crisp or smooth as my FWB 80 or IZH-46m, but it’s a lot better than the Daisy 717/747/777 or the Gamo Compact. 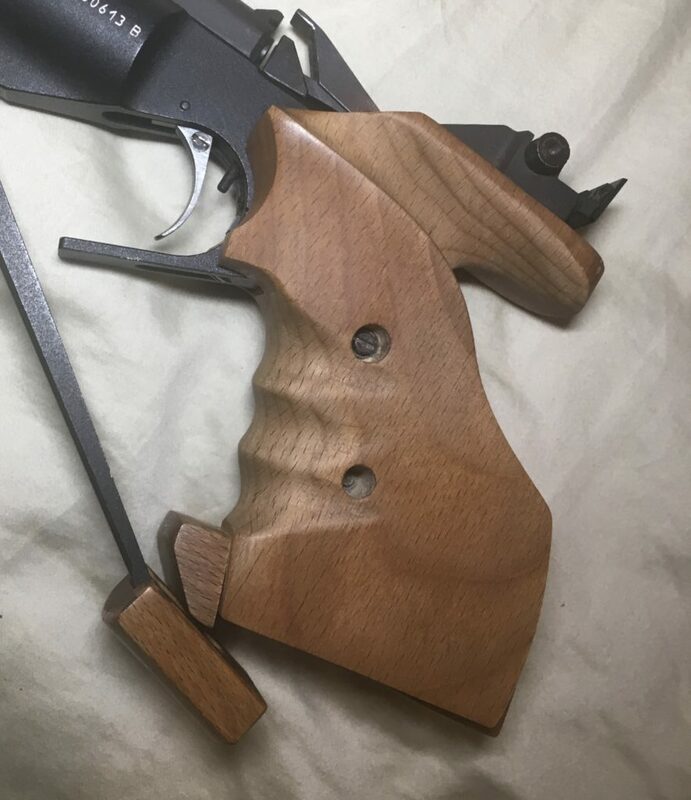 Trigger weight can’t be adjusted as low as the FWB and IZH (I learned this when the adjustment screw popped loose and flew across the room) but it can be set as low as 12 ounces, according to Chiappa. Not a great group, and one wild shot (which I called), but the two shots that felt the best went right into the 10 ring. I can certainly live with that. I haven’t shot competition since 1998, preferring to just compete against myself in my basement 10 meter range. (If I intended to compete, I’d sell all three of my air pistols and buy one good PCP pistol.) But if you’re looking for a starter pistol for competition, this wouldn’t be a bad choice. If the IZH-46m was still available, that would be my first choice, but they haven’t been imported for a while. The Gamo costs around $150 less, but the trigger on the Gamo isn’t nearly as good. The FAS is a fine entry level match pistol, and one that will teach good shooting habits. If you can regularly shoot good scores with this gun, you could move up to an entry-level PCP like the Hammerli AP20 and start winning competitions. If, like me, you just want to shoot informal matches against your friends and yourself, the FAS 6004 is a pistol that you can enjoy shooting for a long time. Postscript: I thought the 6004 might replace one of my other target air pistols, but while deciding which guns to sell as part of a general thinning out of the collection, the 6004 got the nod. In many ways it was one of the most enjoyable match guns to shoot, but I do significantly better with my FWB LP80 and IZH-46m. My recently acquired FWB 300s was a fine shooter as it arrived, but the stock was a mess of scratches and deep dents, and there was rust and bare metal everywhere. I spent several days steaming dents, removing rust, and applying cold blue and aluminum black, and here’s the result. 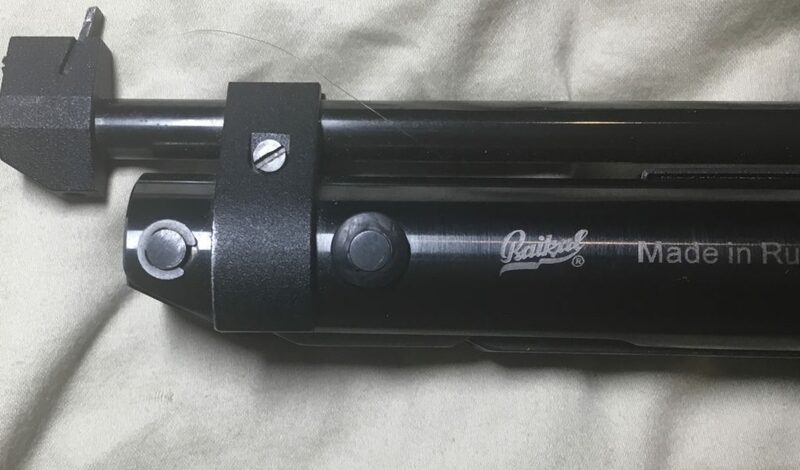 While I did some removal of metal scratches, I didn’t draw file out one large dent in the barrel sleeve. Maybe later. Postscript: Despite how much I liked this rifle, it too eventually found a new home. 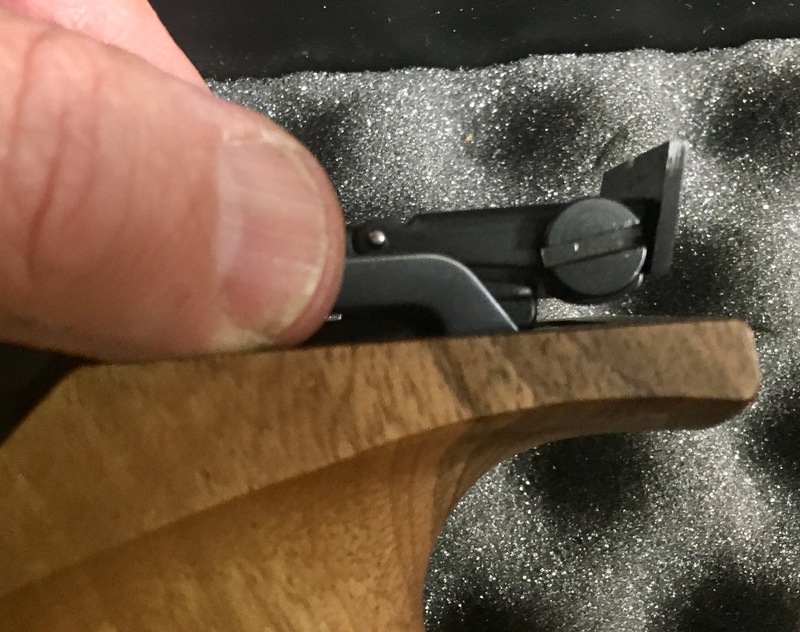 The problem was one of fit: I either had to raise the sights, or lower the cheekpiece to get a good head position, but the stock is non-adjustable, and you can’t fit a riser block under the front sight of the 300S (you can under other 300 models). The only other options were seriously modifying the stock or fitting a scope. I didn’t want to butcher a stock that can’t easily be replaced, and I bought this gun specifically to shoot with iron sights, so off it went. 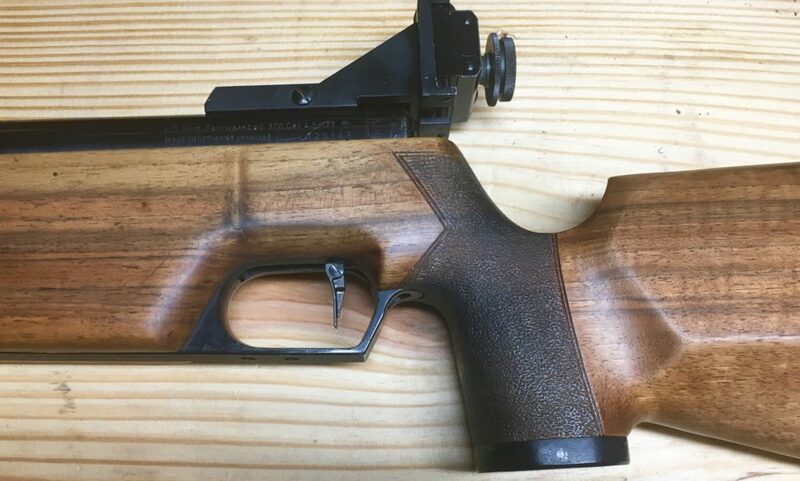 Way back in 2007 I wrote about the Feinwerkbau 300, a gun I had fired a few times but never owned. Then just a few weeks ago I found a very affordable one in a a target shooting forum I regularly check into . I sent payment, and four days later it showed up on my porch. It’s actually a 300S, a later version with a few improvements. There were several models made, mostly differing in the stock and the sights. There was the standard 300S, a Running Boar version, set up for scope use, a Universal model, and a junior model, and maybe more. Feinwerkbau made untold thousands of them between the 300 in (I think) 1968 and its replacement with the single-stroke pneumatic FWB 600, though I believe they kept making the 300S for some years after the introduction of the 600. . 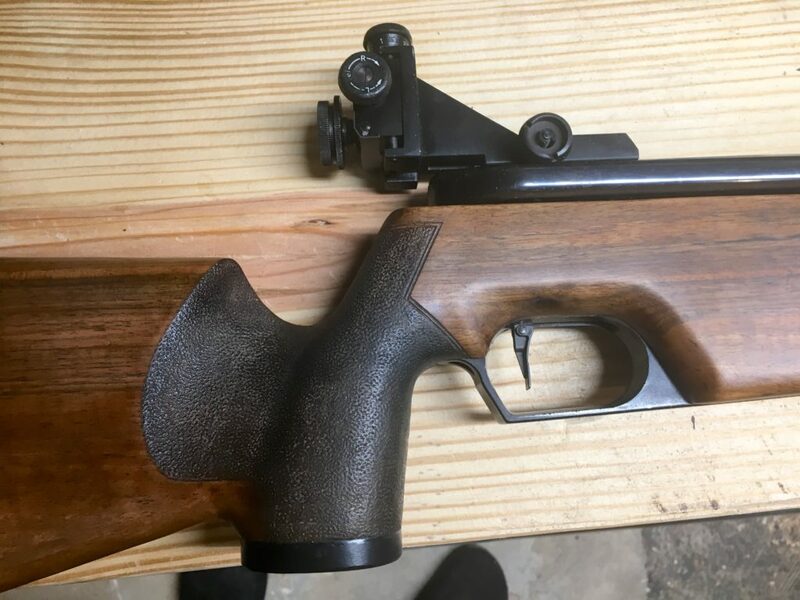 This particular rifle has seen a lot of use, judging by the scores of dents in the wood and the scratches in the metal, but it’s been well maintained where it matters. It was resealed not too long ago and shoots smoothy and accurately- more accurately than I can, certainly. 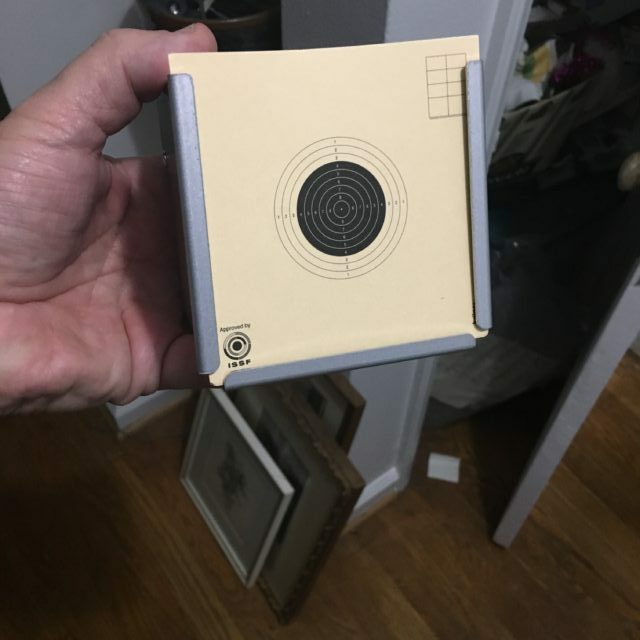 I started out shooting it at my Gehmann air pistol target trap, which inflated my ego, as I was getting a lot of 10s, but then the Gehman air rifle trap and targets I’d ordered arrived to put me in my place. These were fired at a distance of 10 meters- official ISSF distance. 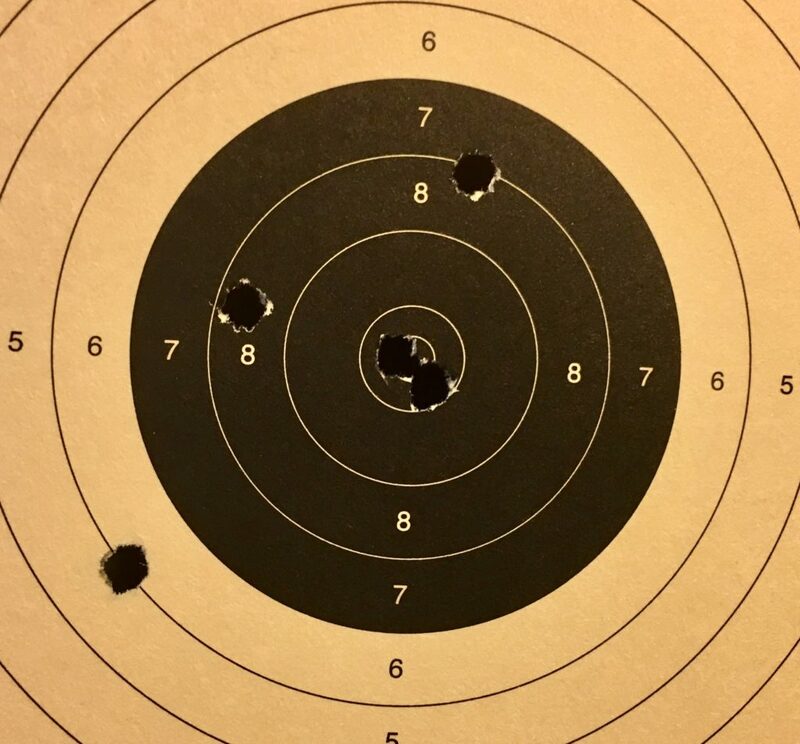 On an air pistol target, those would be 9s and 10s. 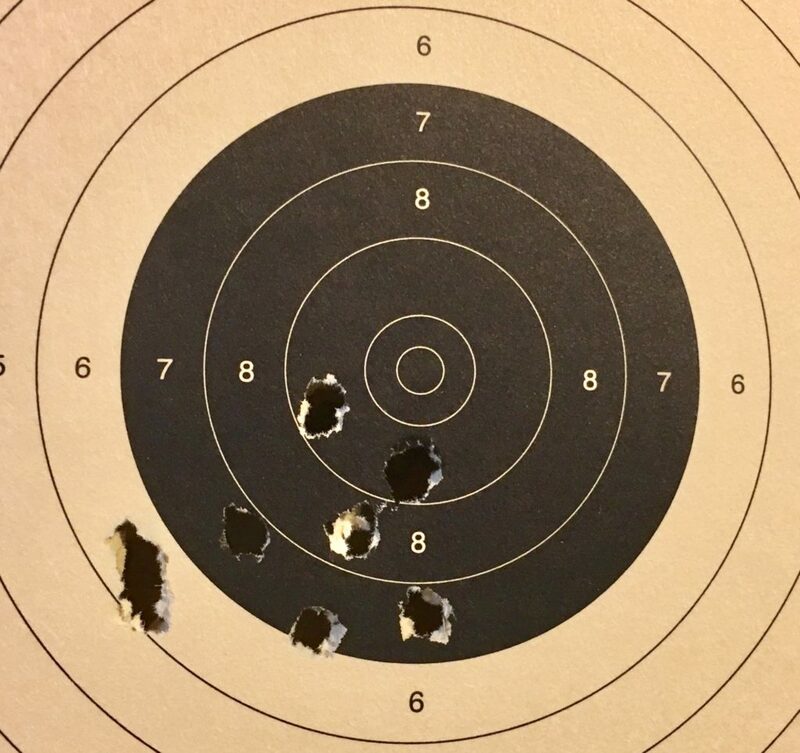 On this target, it’s a 9, three 7s, and a 5. 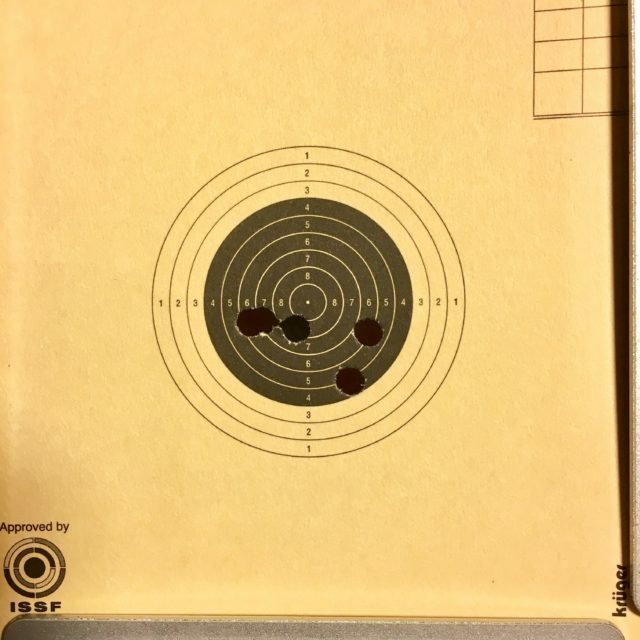 In international competition, the 10 ring is further divided into decimal fractions, so depending on how well centered your shot is, it might scope anywhere from 10.1 to 10.9. I definitely have a lot of work to do over the winter. Mine cost me $20 + shipping from an eBay supplier. I’ve got two of the pistol traps, too. Less walking across the basement to replace shot out targets. Over the winter I plan on removing the heavy varnish that’s been applied to this stock, raising as many of the dents as I can, using steam, and refinishing it with a Tru-Oil finish, which I think will compliment the walnut stock much better. I’ll post photos in this blog when I do.